1. Your insurance company is going to send out an adjuster who is going to prepare an estimate and issue you a check. It is possible, and well within their right under your policy to withhold a portion of the payout as “recoverable depreciation”. The only way the homeowner recovers the remaining portion of the claim is if the work is completed and it exceed the amount of the first check issued and the deductible responsibility. In order for a Roofing or other contractor to “absorb” your deductible cost and still get paid the remainder of the claim, they need to prepare and submit a fraudulent invoice. The invoice will have to charge the total cost of the roof/project to exceed the first check and deductible responsibility for the claim. Once the carrier issues the depreciation check and it is received by the homeowner, the contractor prepares a second invoice that reflects the cost of the job without the deductible cost for the homeowner. That is the fraud. Once you become a party to the fraud you are as responsible as the perpetuator of it. 1. If the contractor is willing to lie to the insurance company in order to get a job, what makes you think he/she won’t lie to you? 2. If all contractors in the area follow market costs for supplies and labor and your contractor is charging significantly less for the job- where is the discount coming from? a) Unqualified estimator making a measurement or calculation mistake? If that is the case, you can bet they will come back to you and the insurance company for the additional amount they missed. This is a tactic often used to secure a contract!! c) Day Labor- you know who they are. You pick them up on specific cites in Dallas and Plano and pay them cash to work for the day. Many of them are not legal residents. The same person is not usually picked up if there is a second day of work. d) No Insurance. Many roofing contractors will tell you they are self- insured or they have insurance. First of all, the State of Texas requires at least $50,000.00 of General Liability coverage for a Roofing Contractor. The Better Business Bureau and Roofing Associations require the coverage to be a minimum of $1,000,000. If you are self insured, you are required to have over one million dollars in liquid assets (bank accounts). You will want that guarantee in writing from a bank, no? e) No office/ overhead. This is all about accountability and reliability. If the contractor is working out of his/her home, they will be operating with a lower overhead than one with an office. However, they cannot offer the security that an office space provides a consumer. In order to have an office space, you have to sign a long term contract and have great credit that is established over a period of time that usually is greater than 3 years. There is NO GUARANTEE OF LOCATING A CONTRACTOR AFTER WORK HAS BEEN COMPLETED, but having a secure office space makes a business more accountable to its consumer. Members of the North Texas Roofing Contractors Association and Roofing Contractors Association of Texas have been trying to lobby the State of Texas to regulate roofing contractors to have a license. The state has not agreed to date, which puts us in a position to self regulate. You will find some inconsistency in the market place about companies willing to commit fraud. The truth is, most companies willing to perpetuate it either don’t have any idea they are doing it, or they don’t care. Either way, it should be pretty scary as a consumer to do business with a company willing to commit fraud. (a) a person who sells goods or services (this is your contractor) commits an offense if: (1) The person advertises or promises to provide the good or service and to pay; (A) all or part of any applicable insurance deductible; or (B) a rebate in an amount equal to all or part of any applicable insurance deductible; (2) the good or service is paid for by the consumer from proceeds of a property or casualty insurance policy; and (3) the person (contractor) knowingly charges an amount for the good, or service that exceeds the usual and customary charge by the person for the good or service by an amount equal to or greater than all or part of the applicable insurance deductible paid by the person to an insurer on behalf of an insured or remitted to an insured by the person as a rebate. (b) A person (Homeowner/ Property owner) who is insured under a property or casualty insurance policy commits an offense if the person: (1) submits a claim under the policy based on charges that are in violation of subsection (a) of this section; or knowingly allows a claim in violation of subsection (a) of this section to be submitted unless the person promptly notifies the insurer of the excessive charges. Richardson, Plano, Allen, McKinney, Dallas and the surrounding area. © Copyright 2019. 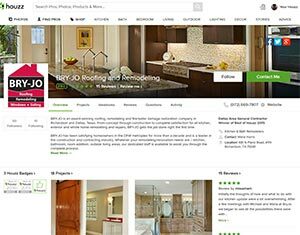 BRY-JO Roofing and Remodeling. All rights reserved.